How about a great reason to get out of the house and to sample some BBQ for a good cause? 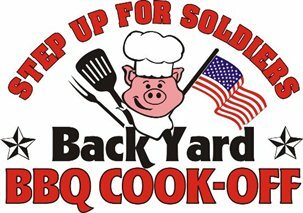 Join us at the 1st Annual Step-Up for Soldiers Backyard BBQ Cook-off! Carolina Beach, N.C. on Saturday, January 28, 2012 twenty-five teams will take to their grills, forks in hand, secret recipes folded and stashed in pockets, all for the glory of the title and the satisfaction of knowing they have raised a significant amount of money for Step Up For Soldiers. The cook-off will be held at the lake in Carolina Beach at the junction of Lake Park Blvd. and Atlanta Avenue and everyone is welcome. Admission is free. Tickets can be purchased to sample the BBQs after the double-blind judging is completed. There will be music, raffles, arts and craft vendors and additional food and drink for purchase. Gates open at 11:00am and prizes will be awarded at 2:00pm. And all to benefit Step Up For Soldiers. Step Up For Soldiers is an all-volunteer non-profit organization dedicated to enhancing the lives of our disabled veterans and their families. Step Up For Soldiers was started in November 2004 by Tom Russell, a retired Port Authority police officer and Vietnam Vet. His intent was to assist wounded soldiers who were sent overseas in response to the 9/11 terrorist attack and he began with building wheelchair ramps for two soldiers who returned home paralyzed from the waist down. The organization has increased from a single person to a small family of nine dedicated volunteers and continues to develop as it grows. Russell’s goal is to help as many families of active and non-active duty soldiers as possible in the Fort Bragg to Camp Lejeune areas by modifying homes and providing other services to veteran and active duty soldiers. There is no better way to spend the day than tasting the best BBQ around, maybe eating some oysters or a burger, listening to great music and browsing through the goods from the arts and craft vendors while helping support such a deserving organization. To volunteer during the event contact Kevin Holton at kwholton@gmail.com or call 919-274-8617. For more information contact Rose McConville at rosemc110@gmail.com or call 910-547-0087. To become a vendor, or for more information about the event or the organization, click here. This entry was posted in Carolina Beach, Dining, Family Friendly, Winter Events by admin. Bookmark the permalink.